Item is a special edition of the Cape Breton Post magazine that focuses on the storming and taking of Vimy Ridge, commemorating the fifty year anniversary of the battle. Item is a pamphlet created in memoriam of Rev. John Pringle. The pamphlet includes accounts of Rev. Pringle's time spent overseas during World War 1, as well as an account of his son's death during service. Item consists of a pamphlet concerning the reintegration of World War 1 servicemen into civilian life. It includes information about acquiring financial assistance, agricultural training, how to purchase land, and transportation rates. Item is a pamphlet that was created to honour Sydney's veterans of World War 1. It includes transcriptions of newspapers articles, articles written by servicemen and Sydney's Honour Roll. Item is a pamphlet containing a collection of Louis Raemaeker sketches related to World War 1. The sketches were inspired by a variety of topics, including the killing of women and children, the death of soldiers, zeppelin attacks, and finance. 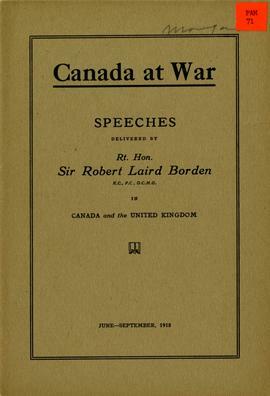 Item is a pamphlet that details the work of Canadian Catholic priests among soldiers during World War 1. A short biography is provided for each of the included chaplains. Item is a pamphlet containing a collection of wartime songs, some written about the Cape Breton Highlanders. Many of the songs within the pamphlet were written by people from Cape Breton. Item is a pamphlet containing a report on the typhus epidemic at Wittenberg Camp. The report was presented to the British Government and outlines the conditions at the Wittenberg Camp and how they contributed to the 1915 epidemic. Item is a pamphlet, published by the Personnel of the U.S. Naval Air Station in North Sydney, on December 1st, 1918. The pamphlet contains the staff muster roll, some pieces of poetry, jokes, and an editorial. Item is a pamphlet concerning the history of the Fourth Canadian Division from 1916 to 1919. The pamphlet includes battle orders and a list of dates of interest. 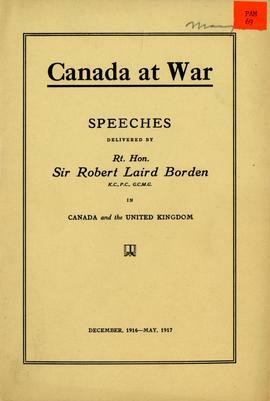 Item is a pamphlet on Canada's role in World War 1, written by Patricia Giesler. This item is written in both French and English and provides information about conflict on land, air, and sea, as well as details about war memorials. Item is a pamphlet outlining life in Gabarus, Cape Breton during World War 1. The pamphlet includes the Gabarus Honor Roll.